L-5-methyltetrahydrofolate tablets is a synergistic of essential supplement that is metabolically active form of folate utilized by the body. Many people are familiar with the benefits of incorporating folic acid supplements into their daily lives. Folic acid, also called folate or vitamin B9, is critical to many body processes, including the health of the nervous system, blood, and cells. Folic acid may also protect against heart disease, birth defects, osteoporosis, and certain cancers. Many of the benefits derived from folic acid are a result of its role in methylation, which is necessary for healthy homocysteine metabolism, proper DNA function and neurotransmitter synthesis. It help to reduces the risk of neonatal neural tube defects. Thus increased folate intake is now recommended before and during the early stages of pregnancy, through folic acid supplements or fortified foods. Furthermore, there is growing evidence that folic acid may have a role in the prevention of other diseases, including dementia and certain types of cancer like colon cancer or cervical cancer. ●	It is indicated for the distinct nutritional requirements of patients with endothelial dysfunction. (The inner lining of blood vessels) who present with loss of protective sensation and neuropathic pain associated with diabetic peripheral neuropathy. ●	It is indicated to reduces the risk of neonatal neural tube defects. through folic acid supplements or fortified foods. It also play important role in the prevention of other diseases, including dementia and certain types of cancer. ●	It is used to prevent colon cancer or cervical cancer and also used to prevent heart disease and stroke, as well as to reduce blood levels of a chemical called homocysteine. High homocysteine levels might be a risk for heart disease. 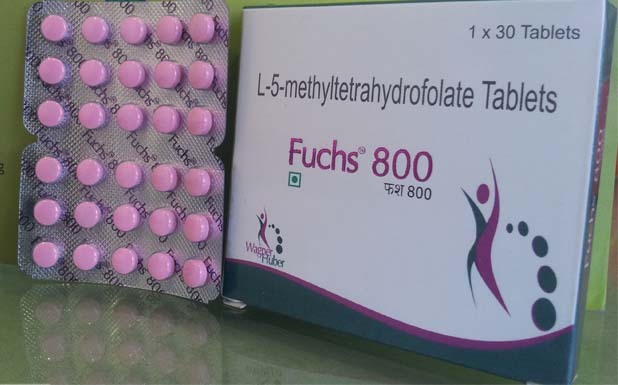 L-methylfolate or 6(S)-5-methyltetrahydrofolate [6(S)-5-MTHF], is the primary biologically active diastereoisomer of folate and the primary form of folate in circulation. It is also the form which is transported across membranes into peripheral tissues, particularly across the blood brain barrier. In the cell, 6(S)-5-MTHF is used in the methylation of homocysteine to form methionine and tetrahydrofolate (THF). THF is the immediate acceptor of one carbon units for the synthesis of thymidine-DNA, purines (RNA and DNA) and methionine. About 70% of food folate and cellular folate is comprised of 6(S)-5-MTHF. Folic acid, the synthetic form of folate, must undergo enzymatic reduction by methylenetetrahydrofolate reductase (MTHFR) to become biologically active. Genetic mutations of MTHFR result in a cell's inability to convert folic acid to 6(S)-5-MTHF. D-methylfolate or 6(R)-5-methyltetrahydrofolate [6(R)-5-MTHF] is the other diastereoisomer of folate. Studies administering doses of 2.5 mg per day or higher resulted in plasma protein binding of D-methylfolate higher than L-methylfolate causing a significantly higher renal clearance of L-methylfolate when compared to D-methylfolate. Further, D-methylfolate is found to be stored in tissues in the body, mainly in the liver. D-methylfolate is not metabolized by the body and has been hypothesized to inhibit regulatory enzymes related to folate and homocysteine metabolism and reduces the bioavailability of L-methylfolate. Pyridoxal-5′-phosphate (PLP) is the active form of vitamin B6 and is used as the prosthetic group for many of the enzymes where this vitamin is involved. PLP is readily absorbed by the intestine by a process which is preceded by dephosphorylation to form pyridoxal. The phosphate group is regained during passage through the intestine. Pyridoxine, the parent compound of PLP and the most frequently used form of vitamin B6, requires reduction and phosphorylation before becoming biologically active. Methylcobalamin (Methyl-B12) is one of the two forms of biologically active vitamin B12. Methyl-B12 is the principal form of circulating vitamin B12, hence the form which is transported into peripheral tissue. Methyl-B12 is absorbed by the intestine by a specific mechanism which uses the intrinsic factor and by a diffusion process in which approximately 1% of the ingested dose is absorbed. Absorption and Elimination: L-methylfolate is a water soluble molecule which is primarily excreted via the kidneys. In a study of subjects with coronary artery disease (n=21), peak plasma levels were reached in 1 to	3 hours following ORAL/PARENTERAL administration. Peak concentrations of L-methylfolate were found to be more than seven times higher than folic acid (129 ng ml-1 vs. 14.1 ng ml-1) following ORAL/PARENTERAL administration. The mean elimination half-life is approximately 3 hours after 5mg of oral L-methylfolate, administered daily for 7 days. The mean values for Cmax, Tmax, and AUC0-12 were 129 ng ml-1, 1.3 hr., and 383 respectively. Distribution: Red blood cells (RBCs) appear to be the storage depot for folate, as RBC levels remain elevated for periods in excess of 40 days following discontinuation of supplementation. Plasma protein binding studies showed that L-methylfolate is 56% bound to plasma proteins. High dose folic acid may result in decreased serum levels for pyrimethamine and first generation anticonvulsants (carbamazepine, fosphenytoin, phenytoin, phenobarbital, primidone, valproic acid, valproate). This may possibly reduce first generation anticonvulsants effectiveness and/or increasing the frequency of seizures in susceptible patients. While the concurrent use of folic acid and first generation anticonvulsants or pyrimethamine may result in decreased efficacy of anticonvulsants, no such decreased effectiveness has been reported with the use of L-methylfolate. Drugs added to L-5-methyltetrahydrofolate may alter the intestinal microflora and may decrease the absorption of methylcobalamin. Cholestyramine, colchicines or colestipol may decrease the enterohepatic re-absorption of methylcobalamin. Metformin, para-aminosalicylic acid and potassium chloride may decrease the absorption of methylcobalamin. Nitrous oxide can produce a functional methylcobalamin deficiency. Several drugs are associated with lowering serum folate levels or reducing the amount of active folate available. First generation anticonvulsants (carbamazepine, fosphenytoin, phenytoin, phenobarbital, primidone, valproic acid, valproate) and lamotrigine (a second-generation anticonvulsant) may decrease folate plasma levels. Information on other second-generation anticonvulsants impact on folate levels is limited and cannot be ruled out. Diavalproex sodium, topiramate, gabapentin, pregabalin levetiracetam tiagabine zonisamide, have not reported the potential to lower folate in their respective prescribing information. Methotrexate, alcohol (in excess), sulfasalazine, cholestyramine, colchicine, colestipol, L-dopa, methylprednisone, NSAIDs (high dose), pancreatic enzymes (pancrelipase, pancratin), pentamidine, pyrimethamine, smoking, triamterene, and trimethoprim may decrease folate plasma levels. Warfarin can produce significant impairment in folate status after a 6-month therapy. The mechanism of action of 5-MTHF is through its role as a methyl donor in a range of metabolic and nervous system biochemical processes, as well as being indirectly necessary for DNA synthesis. Serine reacts with tetrahydrofolate, forming 5,10-methylenetetrahydrofolate, the folate derivative involved in DNA synthesis. The enzyme 5-MTHFR converts 5,10-methylenetetrahydrofolate to 5-MTHF, which donates its methyl group to cobalamin (vitamin B12), forming methylcobalamin. The enzyme methionine synthase catalyzes the donation of methylcobalamin's methyl group to the amino acid metabolite homocysteine, converting it to the amino acid methionine. Methionine subsequently is converted to S-adenosylmethionine (SAMe), a methyl donor involved in numerous biochemical processes. contraindicated in persons with a history of hypersensitivity. From the above discussion, it can be concluded that this L-5-methyltetrahydrofolate tablet improve the quality of life with endothelial dysfunction and neonatal neural tube defects. We are making superior quality of L-5-methyltetrahydrofolate that is used to treat endothelial dysfunction and neonatal neural tube defects.. Our offered tablet is processed using high grade chemical compounds and other required drugs by our experienced quality controllers that ensure its quality, purity and chemical properties. Highly treasured among the clients for its reliability, accurate composition, excellent physical and purity, this tablet is offered to our esteemed clients at the market leading prices.